You can have the time of your life and get fit at the same time! Every Wednesday night at the Copacabana, literally hundreds of people turn up to learn ceroc. This dance is a fusion of French-Latin styles and is often called modern jive. The music is pumped and so are the students as instructors Anita and Sean lead the way on the dance floor. Beginners get right into it. Lines are formed and Anita and Sean demonstrate the first sequence. Everyone has a ball trying it out for themselves before it’s time to say goodbye to one partner and hello to the next. By the end of a class you will probably have danced with everyone at least twice. It’s a great way to find your feet and a friend at the same time. Anita and Sean keep everyone on their toes by moving onto the next step sequence. At the end of the class it’s time to put it all together and see if you can jive out to the whole song. Then you’re on your own. The instructors clear the space for freestyle. Everyone gets on the floor and goes for it. After twelve weeks at beginner’s level, you can consolidate your techniques with a small test and move on up to intermediate. This is where the fun really begins. Ceroc was born in France at the end of World War II. It’s one of the most stylish and entertaining dance forms to watch, just because the dancers look like they are having so much fun. At intermediate level, dips and twists and small lifts are introduced. It’s time to get creative with the choreography. There are overtones of dirty dancing in ceroc, and the more experienced dancers aren’t afraid of a little contact. And if you keep up your ceroc classes it won’t be long before you are as good as these guys. Everyone clapped along as some of the country’s finest dancers put on a show. Advanced ceroc dancers are adept at aerial lifts and acro-balance. You can start learning these once you’ve been doing intermediate for a while. Many hours of practice and study have gone into these routines though the dancers make it all look so effortless. But ceroc must be quite a work-out judging by the overall muscle tone on the dancers. This sure beats going to the gym to get fit. Then it was time for the head of the school to get up and strut her stuff. Caterina and her partner Calvin performed a flamenco-inspired routine with some lift work that left the audience floored. Just by watching these champions in action you can tell they are so comfortable with the technique; they can relax into it enough to infuse the performance with character and style. It all comes with practice and dedication. So if you’re after a whole lot of fun mixed in with your fitness, and a dance style that will get your brain working just as hard as your feet, hop along to ceroc – French-Latin modern jive. It’s sure to give your spirits and fitness level a lift! 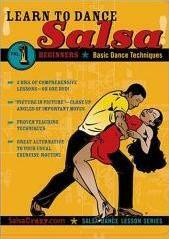 A Beginners Guide to Salsa Dancing! No Experience or Skills Necessary!